This trip up to the James Bay region was part of a longer trip I dubbed "To the Ends of The Roads". It included the Trans-Labrador Hwy across central Labrador to Goose Bay and back, and also east along the St. Lawrence North Shore to Natashquan and back. These trips are described on my Leatherwood Trail website. When I reached Natashquan at the end of the road on the St. Lawrence North Shore, I turned around and headed back west, the same way I came. On my way back I stopped at this spectacular viewpoint near Baie Comeau, just off the highway. From Baie Comeau I continued west to Tadoussac, which is the place where the Saguenay River flows into the St. Lawrence. Here I headed northwest to the Lac St. Jean area. From Lac St. Jean I headed north into the wilderness along Hwy 167 to Chibougamau. No gas for 190 km along this road. Just mile after mile of forest, as seen in this photo. Just north of Chibougamau the "North Road" starts. I traveled along this road to reach the James Bay Road, rather than going a few hundred kilometers out of my way to start at the beginning. What's a few hundred more kilometers of gravel road, anyway? The North Road starts a little ways north of Chibougamau and runs north and then west to join the James Bay Highway 407 km later, at km274. It was constructed as part of the James Bay project, to facilitate access to other areas of the project. It is a modern gravel road the whole way. As part of the James Bay project, the James Bay/Northern Quebec Agreement created the Municipality of James Bay, the largest municipality in the world with an area of 350,000 square kilometers, yet with a population of only 40,000. The country from Chibougamau northwards is part of this municipality. Of all the roads that I traveled on this trip, the North Road was the emptiest in terms of other traffic. There is only one place to get gas, 285 km from the beginning, at the Cree village of Nemaska. Please note that this travelogue is not designed as a guide to the North Road. Click here for a guide. 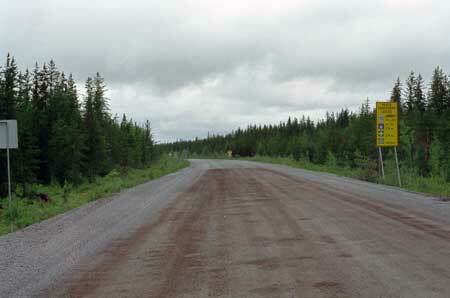 Typical road for the next few hundred kilometers. The yellow sign warns of lack of services for a considerable distance. Here the road crosses the Rupert River, one of the large rivers of the north. It isn't anywhere near as big here as it is downstream where it crosses the James Bay Road (more on this further on). But these rapids are a seething mass of wild roaring water nonetheless. As usual with such things, a photo doesn't really do it justice. There is a remarkable amount of water thundering through this narrow channel! The Municipality of James Bay is officially bilingual: French and Cree. The dead trees you see here are the result of a forest fire.